The Money Tree or Money Plant is probably the most common novelty tropical plant available. Throughout the offices we service, we see this plant almost daily. It is definitely a favourite as a desktop plant. People often have stories about how long they have had them, and how they seem to survive just about anything. They are available for purchase everywhere; corner stores, fruit markets, florists and almost all grocery stores. 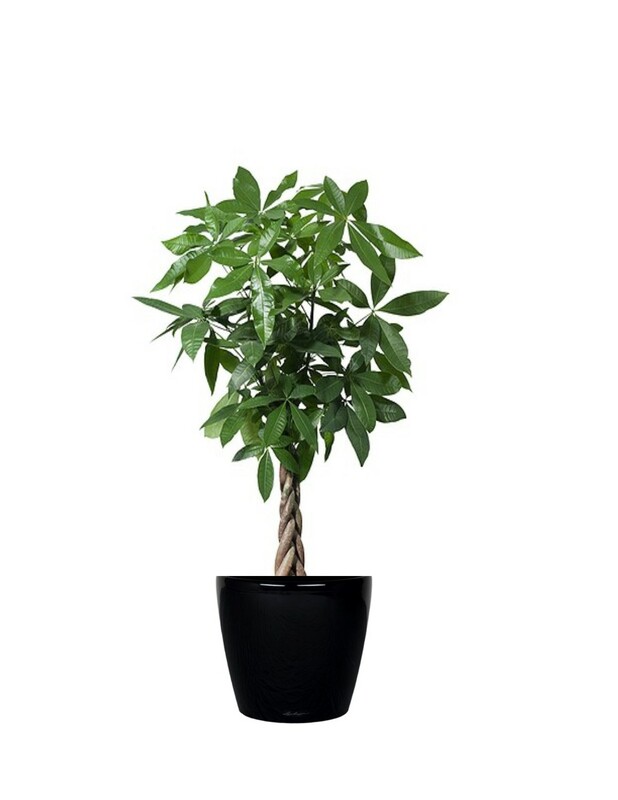 Money Trees are usually grown with an eye-catching braided trunk, and are readily available in many sizes from 6 inches to 6 feet. This hardy tropical plant is native to Central and South America where it grows in swamps. Trees in the wild can reach heights of 60 feet or more. Taiwan is the world’s largest producers of this plant for commercial use. In Asian cultures, a gift of a Money Tree is thought to bring good financial fortune to the receiver. They are often sold for this purpose ornately wrapped in red and gold ribbons. Care of the Money Tree is straightforward. It prefers bright indirect light, but will survive in bright light from fluorescent bulbs. If it is placed directly in a window the leaves may burn. It prefers to dry out between waterings, and then given a thorough watering. Make sure there the soil can drain properly though; the roots will quickly rot if left to stand in water. The Money Tree also prefers a small pot. Do not be too quick to repot into a larger container. Do this only when there is not enough soil to hold water, and then only use a slightly larger pot. Prune new top growth regularly to prevent it from getting top heavy and to encourage growth from the middle of the plant. If the tree does gets too big, it can be cut back drastically. As long as there is enough light, it will quickly grow new shoots from the pruned areas. Browning of the leaves is usually a sign of low humidity and is common in the winter months when the heating systems are on in the office buildings. Fertilize in the spring and summer with a good quality plant food.